Beth Qiang, Fullstack Academy alumnus, first learned how to program while she was working as a data analytics consultant. But, after attending a Python conference in the summer of 2016, Beth instantly recognized her calling to become a Software Engineer. 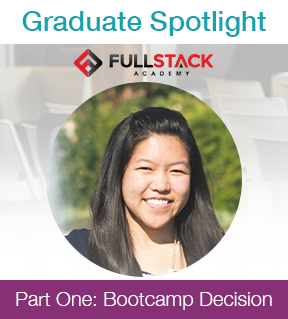 Part One: Follow Beth's decision to attend a Fullstack Academy's prestigious bootcamp program. This Q&A is part one of a series of three. Beth chats about her bootcamp selection & financing in part two. Learn more about what she does now, and how she got there, in part three. Want to stay in the loop on future series? Follow us on Facebook today. Beth joined Fullstack Academy's inaugural Remote Immersive cohort in September of 2016. The 17-week online software engineering program ran until February 2017. Following program completion, Beth landed an awesome job as a full-time Full-Stack Developer. Aside from being hilarious, and so fun to work with, Beth is well on her way to changing the world through code. FIRST THINGS FIRST: TELL ME ABOUT THE REMOTE IMMERSIVE COHORT! Beth: "I loved every second of it. It wasn’t what you might think of when you think of an “online” program: we were required to be present from 9am to 6pm, we had our own instructors who would give live lectures, and the great majority of the work we did was via pair programming or working in teams." Fullstack Academy is one of Skills Fund's high-quality bootcamp partners. 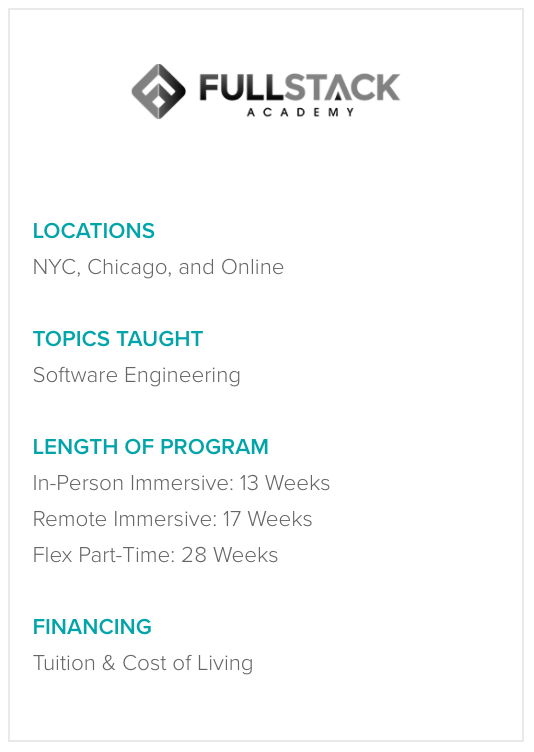 Fullstack offers a 13-week Software Engineering Immersive program and a 28-week Flex Part-Time Immersive program in both NYC and Chicago. Students all over the country can take advantage of their 17-week Remote Immersive option. Fullstack Academy provides an education that equips everyone with the skills to become superstar software engineers or software developers. WHAT MADE YOU DECIDE TO ATTEND A BOOTCAMP? YOU'RE DEFINITELY A SELF-STARTER. WHY NOT JUST LEARN TO CODE ON YOUR OWN? Beth: "After building a number of small apps in my downtime, I was struggling in a number of areas. First, working ten hours a day and then coming home to code for hours at a time was exhausting. I wanted more structure and community than I knew I’d be able to find or create on my own in such a short period of time. I wanted to stop worrying about whether learning Angular or React was better. I wanted mentors and classmates to be able to learn from. I wanted to learn how to build scalable apps and adhere to best practices. I wanted to focus on actually learning how to program and solving problems through code, instead of spending a lot of my time trying to figure out what and how and with whom to learn and do." "I spent a lot of time trying to cobble together internet resources to fill in sometimes rather large gaps - I was in a weird in-between in which I was having difficulty finding resources that catered to my level." "And, despite having various communities like Free Code Camp, CodeNewbie, and Women Who Code, it wasn’t easy to find people whose schedule matched mine, who were at the same level as I was, and working on the same things that I was." If you put in the dedication, you'll succeed, but you shouldn't be blind to the amount of work that a bootcamp is accompanied by. It's not easy. Bootcamps are designed to teach you multiple years' worth of skills in a matter of months. It takes a certain mindset and level of commitment to come out on top.